Its time to PARTYYYYY!!!! Yeah! We all are always ready to party and enjoy up to the fullest. At the same time we have to look gorgeous. 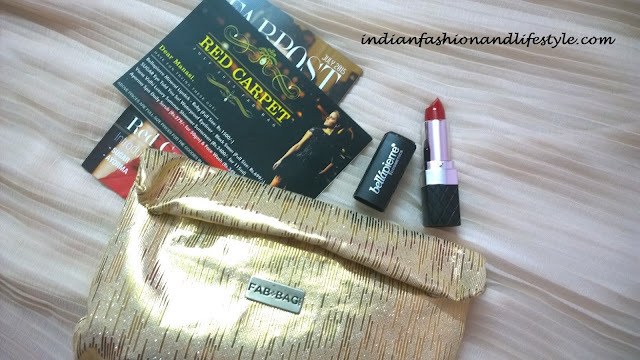 This time fab bag has come up with RED CARPET BAG which will make you party ready in just no time. Before I open the bag and reveal the mystery let talk about the bag first. 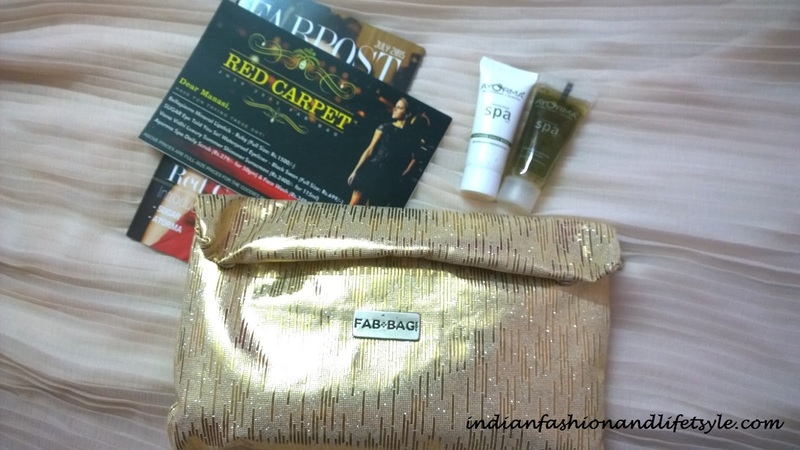 This month's fab bag is not only a bag but a clutch which is golden in color. I like the texture and finish of the clutch. I can carry it to party and add statement to the outfit. Lets check what is in my RED CARPET FAB BAG! When you go to party you either do smokey eyes or just keep it simple with winged eyeliner. I am the person who loves to keep eyes simple. with either winged liner or only mascara. I like this product as the brush is very good. It makes me do the winged thing in just one stroke. Yes it does not get washed in rain. This sunscreen is flowy in texture and is loaded with fine shimmer particles which adds instant glow to the skin. The best part is the shimmer particles can be easily spread over the skin without overloading the skin. 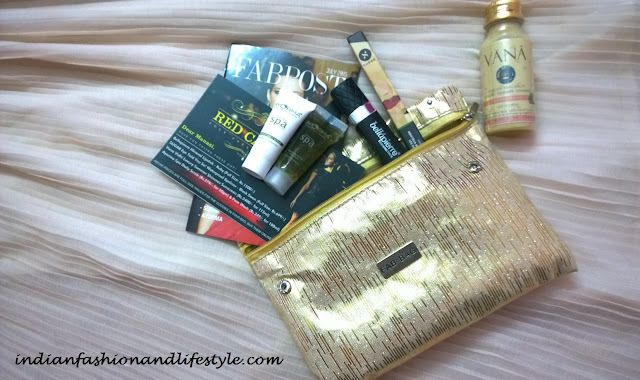 I am going to buy a full size product as in bag I received 60ml bottle. 4. Ayorma Spa Saily scrub &facewash. Lastly are these small samples of scrub and face wash. I like there fragrance but I am yet to try them. 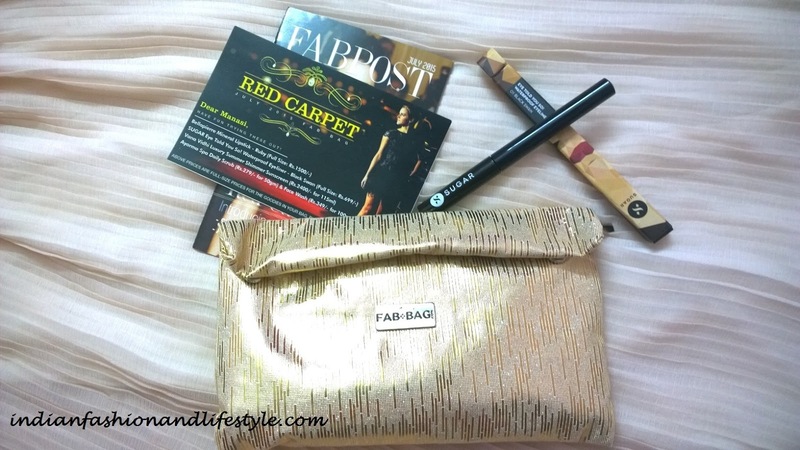 Overall I just love love love fab bag of this month. I like all the products. If you ask me Vana Vidhi shimmer sunscreen wins for me in the bag and of course the golden clutch. 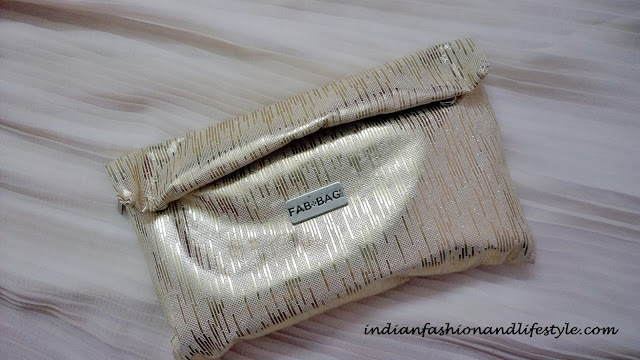 What did you like in july fab bag?